If you are cost conscious and need to control your environment relative to your budget, then you can use programmatic budget notifications to automate your budget actions. 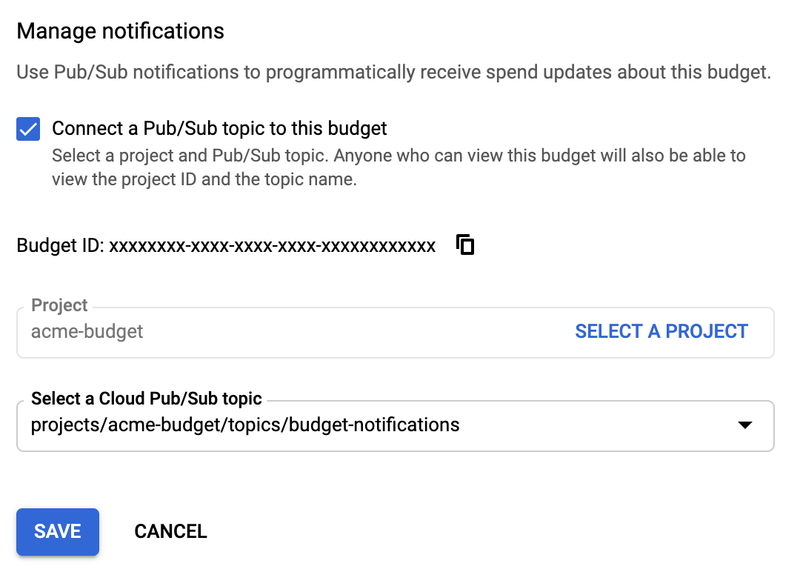 Budget notifications use Cloud Pub/Sub notifications to provide real time budget state, using the scalability, flexibility, and reliability of enterprise message-oriented middleware for the cloud. 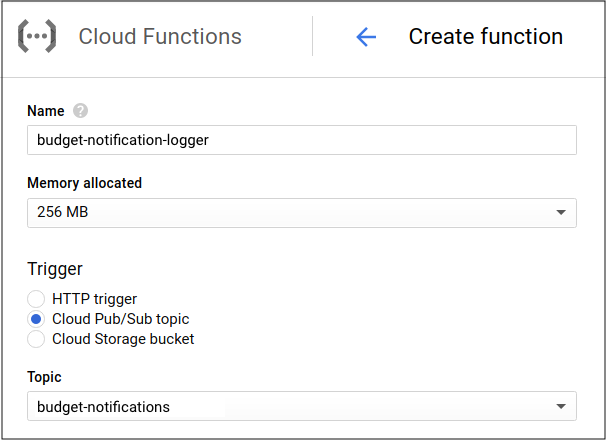 This page has examples and step by step instructions on how to use budget notifications with Cloud Functions to automate cost management. The first step is to enable a Cloud Pub/Sub notification for your budget. This step is described at Manage Notifications. Pub/Sub Topic—This is the configured notifications endpoint for the budget. Budget ID—This is a unique ID for your budget that is included in all notifications. You can locate the budget's ID in your budget under Manage notifications. The ID is displayed after you select Connect a Pub/Sub topic to this budget. The next step is to listen to your notifications by subscribing to your Pub/Sub topic. If you don't have a subscriber, then Pub/Sub will drop published messages and you cannot retrieve them later. Although there are many ways you can subscribe your topic, for these examples we will use Cloud Function triggers. 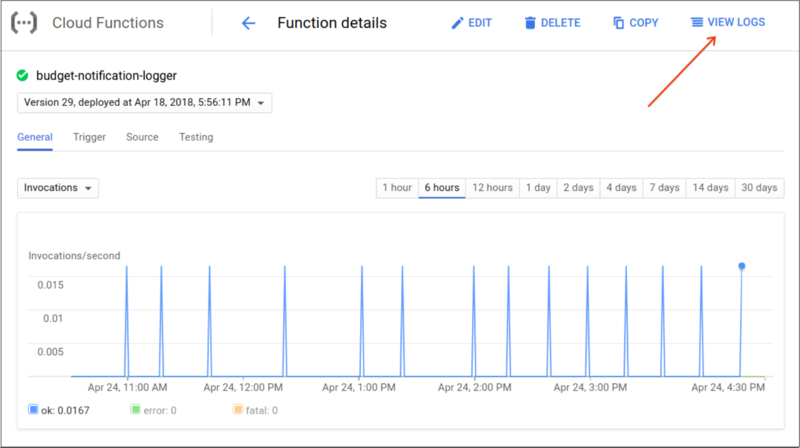 Go to the Cloud Functions page of the Google Cloud Platform Console. Create a new function and give it a name that is meaningful to your budget. Under Trigger, select Cloud Pub/Sub topic. Select the topic that you configured on your budget. Provide source code and dependencies for the function to run. To tell your Cloud Function what you want it to do with the notification, you can either write code using the inline editor or you can upload a file. For details about the notifications your code will receive, see Notification Format. For example, a function might log received Pub/Sub notifications, attributes, and data when triggered by a budget notification. To learn more, see Google Cloud Pub/Sub Triggers. After you save the Cloud Function, you can click VIEW LOGS to view your logged budget notifications. This shows the logs from your function invocations. Email isn't always the best way to stay up to date on your cloud costs, particularly if your budget is critical and time sensitive. With notifications you can forward your budget messages to other mediums. In this example we describe how to forward budget notifications to Slack. This way, every time Cloud Billing publishes a budget notification, a Cloud Function uses a bot to post a message to a Slack channel of the bot's workspace. The first step is to create your Slack workspace and the bot user tokens that are used to call the Slack API. API tokens can be managed at https://api.slack.com/apps. For detailed instructions, see Bot Users on the Slack site. Create a new function following the steps in Create a Cloud Function. Add a dependency on slack npm package to your function's package.json file. Write code to post budget notifications to a Slack chat channel using the Slack API. 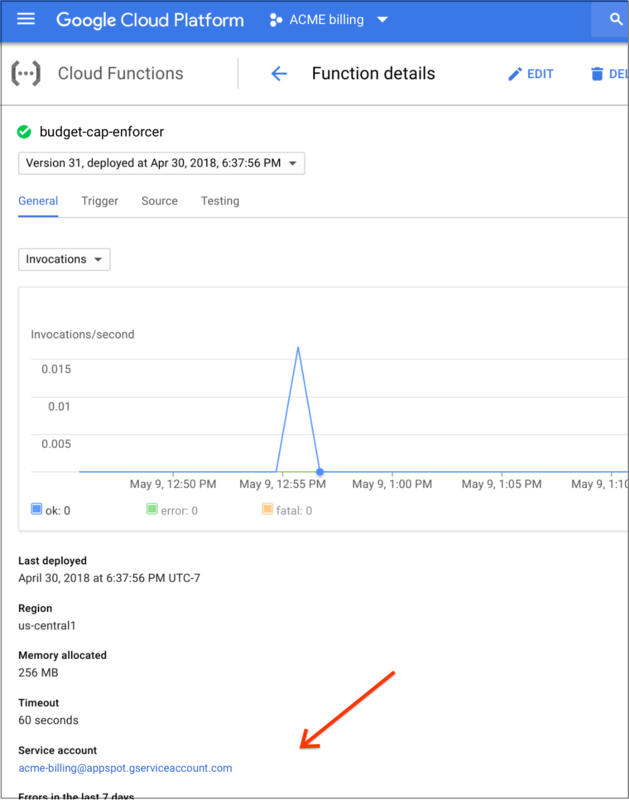 This example shows you how to cap costs and stops usage for a Google Cloud project by disabling billing. This will cause all Google Cloud services to terminate non-free tier services for the project. You might cap costs because you have a hard limit on how much money you can spend on Google Cloud Platform. This is typical for students, researchers, or developers working in sandbox environments. In these cases you want to stop the spending and might be willing to shutdown all your Google Cloud Platform services and usage when your budget limit is reached. Warning: This example removes billing from your project, shutting down all resources. Resources might not shut down gracefully, and might be irretrievably deleted. There is no graceful recovery if you disable billing. You can re-enable billing, but there is no guarantee of service recovery and manual configuration is required. Note: Following the steps in this capping example is not a guarantee that you will not spend more than your budget. This is because there is a delay between incurring costs and receiving budget notifications. Due to usage latency from the time that a resource is used, to the time that the activity is billed, some additional costs might be incurred for usage that hasn’t arrived at the time the all services are stopped. We recommend that if you have a hard funds limit, you set your budget below your available funds to account for delays. For our example, we use acme-backend-dev as a non-production project for which billing can be safely disabled. Before you start, you need to set up a budget to monitor project costs and enable budget notifications. Your Cloud Function is run as an automatically created service account. So that the service account can disable billing, you need to grant it Billing Admin permissions. To identify the correct service account, view your Cloud Function details. The service account is listed at the bottom of the page. 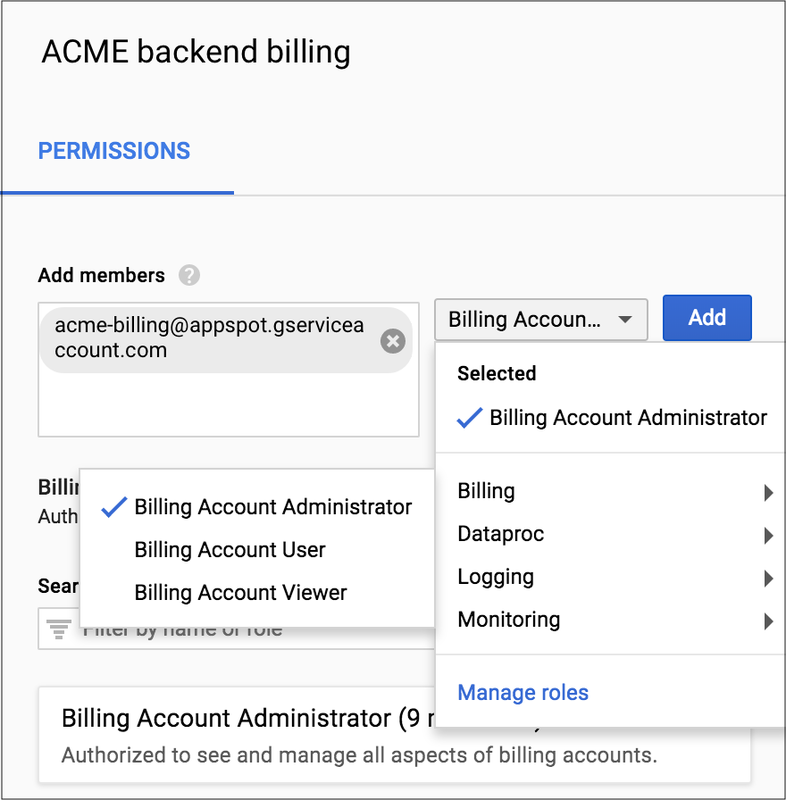 You can manage Billing Admin permissions on the Google Cloud Platform Console Billing page. To grant Billing Account Administrator privileges to the service account, select the service account name. Next you need to configure your Cloud Function to call the Cloud Billing API. This enables the Cloud Function to disable billing for our example project acme-backend-dev. Create a new function using the steps in Create a Cloud Function. Write code to disable billing on the project by removing it from the billing account. Set the PROJECT_NAME parameter. This is the project that you want to cap (disable) billing for. When the function is triggered, you can validate that your Cloud Function was successful. The project will no longer be visible under the billing account and resources in the project are disabled. 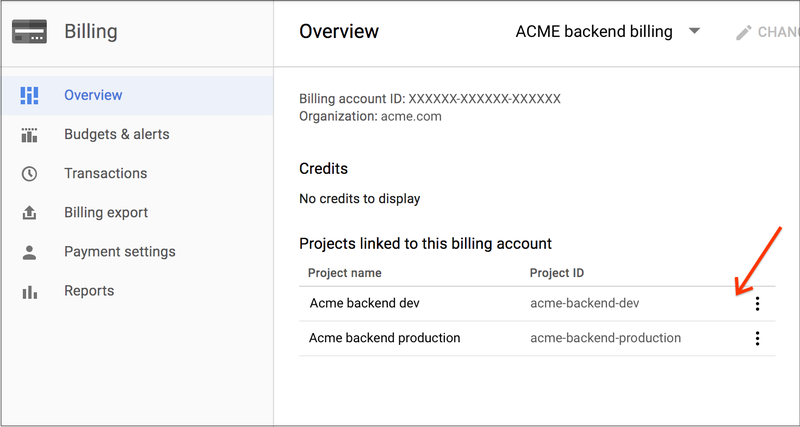 You can manually re-enable billing for your project in the GCP Console. Capping (disabling billing) as described in the previous example is binary and terminal. Your project is either enabled or disabled. When it is disabled all services are stopped and all resources are eventually deleted. If you require a more nuanced response, you can selectively control resources. For example, if you want to stop some Compute resources but leave Storage intact, then you can selectively control usage. This will reduce your cost per hour without completely disabling your environment. You can write as nuanced a policy as you like. However, for our example, our project is running research with a number of Compute virtual machines, and is storing results in Cloud Storage. This Cloud Function example will shut down all Compute instances, but will not impact our stored results after the budget is exceeded. Your Cloud Function is run as an automatically created service account. To control usage you need to grant the service account permissions to any services on the project that it needs to make changes. Note: Security best practice is to grant least privilege specific to the services it will manage. To identify the correct service account, view the details of your Cloud Function. The service account is listed at the bottom of the page. 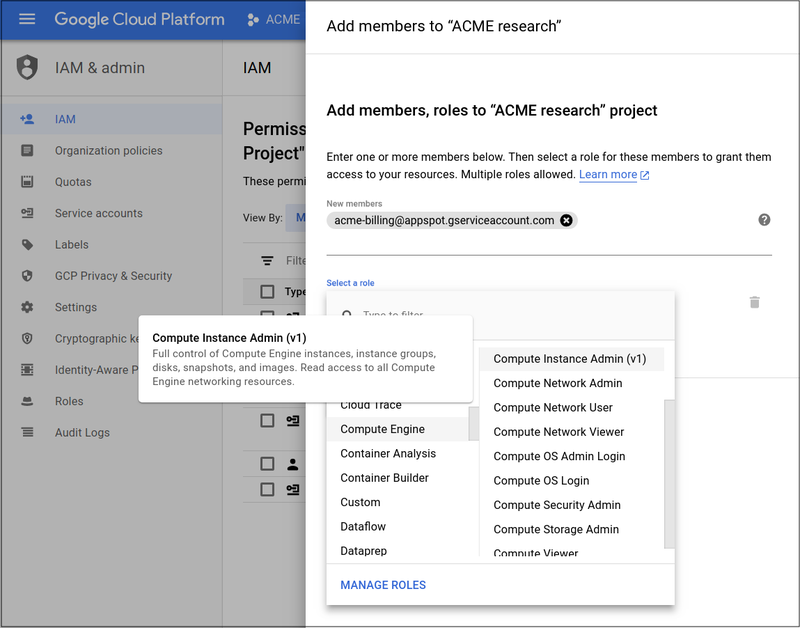 Go to the IAM page of the GCP Console to set the appropriate permissions. Make sure that you have added the dependencies described in Cap (disable) billing to stop usage. Write code to shut down resources in the project. Set the PROJECT_NAME parameter. This is the project you want to configure for capping. You can validate that the function ran successfully by checking your Compute virtual machines were stopped in the GCP Console.